Hibs keeper Ben Williams saved a Niall McGinn penalty as the visitors battled for a draw that maintains their two-point cushion over the hosts. "It's an example of so many games here," said Brown. "I think that was the fourth 0-0 result, and on every occasion I've felt we dominated the game. We need to be more clinical." And he added: "When you miss a penalty, it's the ultimate in missed chances, and then the header that fell to Peter Pawlett was even easier to score. "Any informed observer watching that will know that the team is playing well, and I'm delighted that that's the case." The Dons have struggled for bodies in the middle of the park over the last couple of months, but there is finally light at the end of the tunnel on the injury front with the likes of Rob Milsom, Isaac Osbourne and Stephen Hughes returning to action. "The guys coming back from injury have strengthened our team," added Brown. "They've been out for a long time and we've been limping along without them. 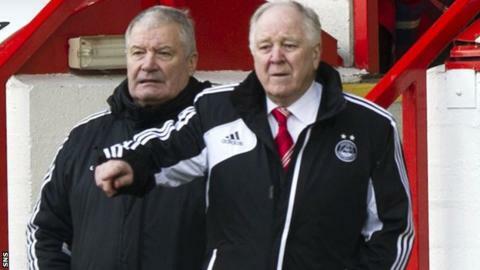 "We lost Russell Anderson with a training injury yesterday, and Andrew Considine to a broken leg a couple of weeks ago. Chris Clark similarly - he's had an operation. "We've still five players out but, without them, I feel that the team is playing well enough."